Back in the spring of 2010, the Epsom Old Home Committee approached me about directing a race that would benefit Webster Park where the Epsom Old Home Day is held every year. There had been a 5k there back in the 80's for a couple of years and was then discontinued. Wendy and I came up with three different out and back distances for a possible race - a 5K, a 4 miler and a 5 miler. We settled on the out and back 4 miler since the Epsom Central School was 2 miles away and this would make a good turn around location. Because of Epsom OHD activities on Saturday, we decided to hold the race on Sunday morning - the final day of the activities. 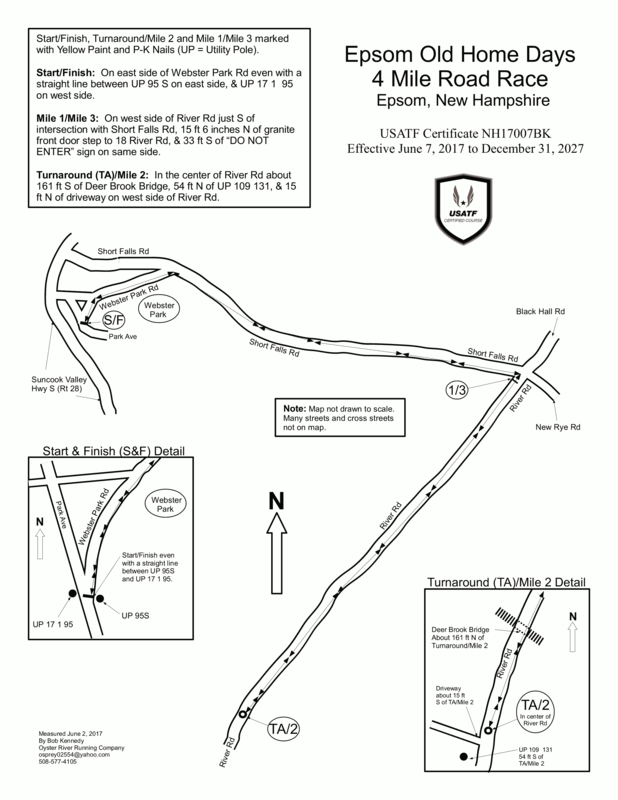 The purpose of the race has always been to benefit Webster Park - about a 30 acre tract of land that was donated to the town of Epsom NH by Benjamin Noah Webster in the early 1900's to be used as a perpetual park for the residents of Epsom. The park has been used for various athletic activities and includes a playground, a covered pavilion, a swimming hole on the Suncook River and a gazebo that is used for summer band concerts. Back on September 11, 2016 the park was hit by a microburst that downed about 100 trees. The park remained closed that fall and winter and finally opened again in May of 2017. All proceeds from the race will be used for the upkeep and improvement of Webster Park in keeping with the intent of the gift by Mr. Webster 100 years ago! The 2 mile walk proceeds to the turn around at mile 1 just beyond the Odd Fellows Hall and returns to Webster Park.